I begin with the more common connection methods and situations. You may already have got the message that I strongly suggest that you fit a chimney liner rather than connecting directly to a chimney. If you are going to connect your flue pipe directly to your chimney please consult with your Building Control Officer. You do not have to line your chimney with a chimney liner. Building regulations allow direct connection of flue pipe to chimney as long as there is no danger of the building catching fire and that the combustibles (smoke) are successfully taken away via the flue. Danger of the building catching fire? See the page primarily aimed at “Distance to combustibles“. Essentially there should be nothing near to the stove or the flue that can catch fire. Main culprits are wooden fireplace beams but prepare to look for the unexpected. 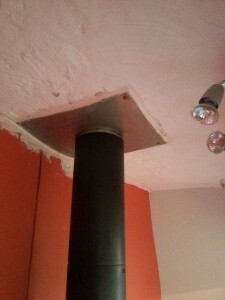 I recently discovered wooden “three by twos” inserted through two chimneys as part of a recent bathroom refurbishment! The offending wood was only discovered when our liner would not go down the chimney and we had to create a hole in the upstairs bedroom. Had we of not lined the chimney chances are that there would have been a fire. Is the chimney suitable? Combustibles being taken away suitably (draft good enough)? Will the chimney pass a Smoke Test 1 (see Two incidents that persuaded me of the importance of chimney lining). If you have a pot lined chimney then probably the easiest method of connection is to use what I call a “top hat” connector. This is a stainless steel flat sheet square with a tube sticking out from it. The square is screwed to the ceiling of the fireplace (Thunderbolts are great for this). Because the diameter of the pot flue will be more than the tube of the top hat then soot could build up on the top hat. Note the diagram shows that I have reached up inside the top hat and flaunched with mortar to provide a funnel so the soot falls into the stove rather than collecting anywhere (soot deposits can catch fire). Update: I have fitted the top hat connectors without problems but have had a problem with one recently. I now recommend a sump adaptor. Obviously the ceiling of your recess might not be nice and flat. Can you make it flat? Using non combustible materials? In our next scribble there is a register plate fitted (glavanised metal minimum 2mm thick) with access doors to sweep and collect soot. A register plate MUST be very securely fitted (usually using “angle-iron” to hold it in place. The plate must be completely sealed to prevent smoke entering the room (you can reach in and feed mortar onto the corners to assist this). 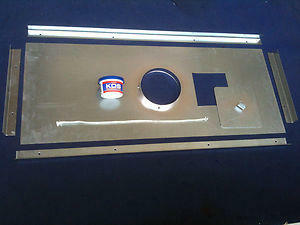 What is the difference between a closure plate and a register plate. This is not ideal. 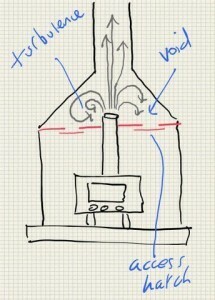 The void can cause turbulence and also cool the smoke so it does not rise up the chimney as it should. I have to say though that it can and does work for some people. BUT you might have problems with the stove drawing properly. Note that just because an open fire worked perfectly in a chimney it does not follow that a modern wood burner will – 0pen fires waste copious amounts of heat up a chimney whereas modern wood burners, being more efficient, put less heat up a chimney; more heat is more draft. 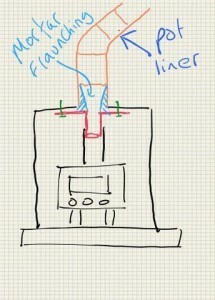 How do you know if the stove is drawing correctly? Well you can just light the stove and see how it performs. You can warm the flue and perform a “Smoke Test 2”. You can measure “draft” using a professional guage (the stove manufacturer will provide the minimum and maximum draft at which the stove will perform well).